Mornings can be hectic. Without a plan, we often begin the day feeling overwhelmed and frazzled before we even get going. 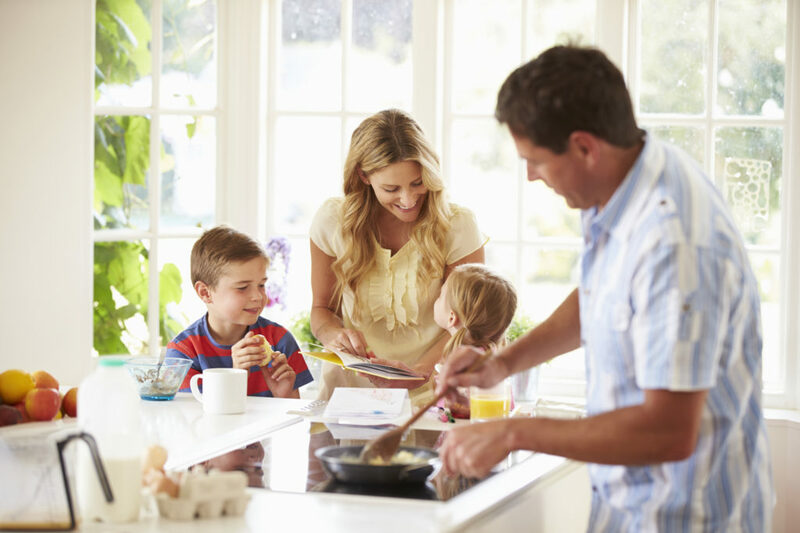 Having breakfast together can help you get your day started both calm and connected. When you share quality time with family each morning, you won’t only be fueling your bodies, you’ll be strengthening your relationships too! And I have a few tips, recipes, and resources to help. There are always some quick breakfasts available like cereal, yogurt, and fruit. But if you want a little more without taking the time to make something in the morning, considered these options you can make ahead of time. Boiled eggs. I love making them in the Instant Pot. This is the method I use to make Perfect Instant Pot Hard Boiled Eggs from A Mind “Full” Mom. Muffins. Here are some of my favorites from Cooking Light: Tuscan Lemon, Chocolate Chocolate-Chip, & Pumpkin-Cranberry. And muffins freeze well. Baked egg muffins. You can really add just about anything you want to egg muffins. Try The BEST Ham & Cheese Egg Muffins from Julie’s Eats & Treats or check out Breakfast Egg Muffins 3 Ways from Cafe Delites. Breakfast burritos. Try these Freezer-Friendly Breakfast Burritos from Money Saving Mom. Sausage-Hash Brown Breakfast Casserole from MyRecipes is one of our favorites. Every time I’ve taken this somewhere, people have asked for the recipe. Baked French Toast from The Pioneer Woman. Probably not the most healthy breakfast, but it’s my go-to for special occasions like Christmas morning. Peach French Toast Bake by Ellie Krieger, Food Network. This one isn’t as sweet as the one above but still very good. Mrs. Ren’s Baked Oatmeal. Years ago a friend of mine shared this recipe with me. I don’t know the original source, but it’s too good not to share. Whip until blended. Then fill measuring cup to the top (2 cups) with milk and set aside. Pour wet ingredients into dry ingredients, stir, then pour entire mixture into glazed baking dish that has been sprayed with cooking spray. Cover and refrigerate 2 hours or overnight. In the morning, bake at 350* for 25 minutes. Serves 4 easily. May be doubled. Keeps for 1-3 days once baked. You don’t have to feel overwhelmed even before the day gets going! Learn how you can begin cultivating the calm, deeply connected life you crave. According to the ages of your children, read from a Bible story book or children’s devotional. If you have teens you can read through different books of the Bible and talk about them. This doesn’t need to be an in-depth Bible study. Just read one passage a day and then talk about it. What is your favorite story from the Bible and why? If you could be any character in the Bible (besides Jesus), who would it be and why? What do you think it means to love your neighbor as yourself? How can you love your neighbor? Describe what you think the Garden of Eden might have looked like. How can you be kind to someone who isn’t being nice to you? What does it mean to forgive someone else? If you could ask any character from the Bible a question, what would it be? How do you think he or she might answer? Do you have a favorite verse from the Bible? Share it and tell use what you like about it. What is your favorite miracle that Jesus did and why? But Dear Mom, you do have the time to do the things God has called you to do. And even if you struggle being consistent, you can continue to grow and learn right alongside of your children. Having breakfast together each morning isn’t a requirement. But it is one thing you can commit to that will help set your day up so that you can grow, connect, and educate. Quality time with family is the foundation to your homeschool! 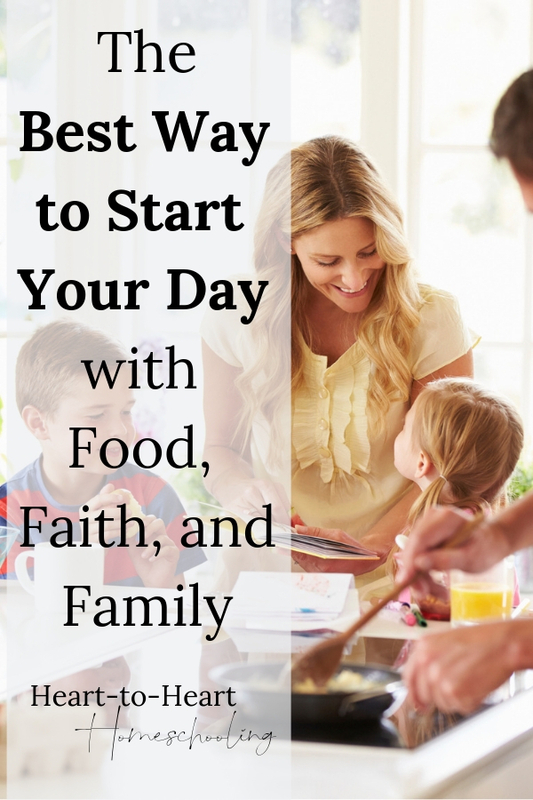 The FREE resource The Christian Homeschooling Mom’s Guide to Beginning Your Day Calm & Connected: 4 Simple Activities to Get Your Day Started Right!